Some stories are just well-told. Time out: The PPCC is all about philosophy of aesthetics, and we appreciate things like sharp narrative structure. In Love Aaj Kal, we were in for an unexpected treat: exciting, razor-tight, efficient pacing. Vah! That may not sound like much, but it was exciting for us. Hindi films tend to be pretty Baroque in their narrative: they spend a lot of time lingering on emotional climaxes, building our interest in characters slowly and in great detail. Just remember the days of Manmohan Desai, where we would follow the Amitabh and Shashi brothers from the sidewalk to the front room, into the kitchen, upstairs, to the bathroom, and all that? There was a reason these movies were long. They were also conventional in their chronology: the scenes were ordered according to the straightforward idea that what happened in Scene B was maybe a few minutes, or maximum a few days, after what happened in Scene A. If a larger jump in time was required, we would experience the required Flashback/Flashforward fuzzy camera + song. This scene felt very Four Weddings and a Funeral, for some reason. So what was very, very refreshing about Love Aaj Kal (Love Today Yesterday) was its use of a more post-modern style of storytelling. The plot spans two different generations, with the modern day love story taking place over several years. And yet - partly (we think) in order to maintain the intimacy of the emotional experience - director Imtiaz Ali abandons the David Lean epic effect in favor of a series of short vignette-style scenes. In this way, the characters and their romance is painted in broad brushstrokes; things are intimated and suggested more than explored in any great detail. And yet, paradoxically, as we abandon the mundane details of their lives in favor of a series of speedy snapshots, it becomes more realistic and more engaging! It's a bit like a Michael Ondaatje novel - most scenes don't last more than a minute or two, and they jump forward months and even years. Yet we never lose touch with the main thread. 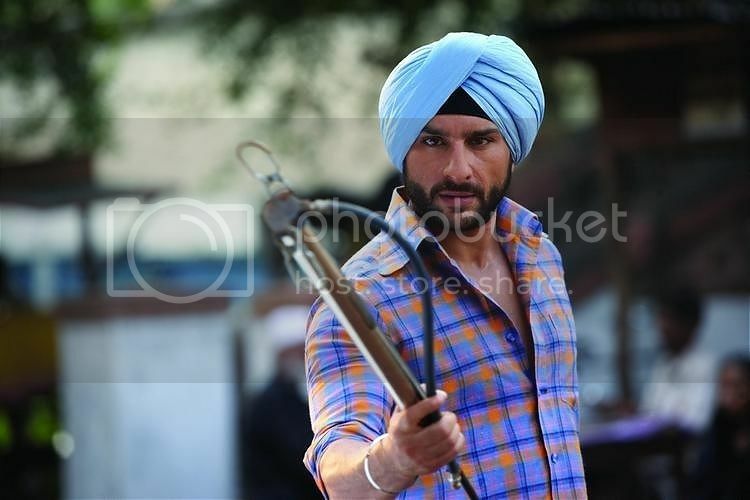 Saif looking very good as a Sardarji. That thread is the slow realization that Jai (a slightly plastic-looking Saif Ali Khan) and Meera (an unexpectedly wonderful Deepika Padukone) really do love each other in the old fashioned, soulmate way. A pair of light-hearted, cosmopolitan career people, Jai and Meera meet in a bar, date, enjoy each other's company and, when Meera's job takes her from London to Delhi, amicably part ways. Neither seems particularly devastated by their parting, there are no proclamations of eternal love. In fact, the two are pretty convinced that such love doesn't exist! "Those 'made in heaven', 'can't live without you' soulmate types. They only exist in stories," Jai says confidently (and later in the film, desperately). "We're just regular people." Their eventual understanding, over years and distance and obstacles, that they were, and are, in Love with a capital L, is a pleasure to watch. And it's partly helped along by a wonderful (CAN HE BE ANYTHING LESS THAN WONDERFUL THESE DAYS? THE ANSWER IS NO) Rishi Kapoor, who plays a sympathetic Sikh London coffee shop owner. As Kapoor relates his ultra-romantic, traditional love story from yore, we cut rapidly back and forth between the 1970s Delhi of the young Kapoor (played by Saif Ali Khan) and Harleen (Giselle Monteiro) - with its cinematic train departures, disapproving fathers and midnight escapes - and the stubbornly cynical text messages of post-modern Jai and Meera. The moral of the story: stop trying to deny your old fashioned heart goo, Generation Y! We have very soft spots for jump cuts, drastic cross cuts (as between Sardar Saif and 2009 Saif) and old Rishi Kapoor, and we are also - at heart - old fashioned romantics, so we really enjoyed this film. Saif Ali Khan is dependably charismatic, and, since the film is mostly from his perspective, he does a fine job taking us through the highs and lows of Jai's awakening. He also impresses as the passionate young Punjabi in the old timeline. Deepika Padukone was surprisingly great - we say "surprisingly" because her roles in Om Shanti Om and Chandni Chowk to China were mostly throwaway stand-and-pose affairs. Or maybe she's maturing as an actress? Either way, she was just great. Rishi Kapoor... well, need we say more? What happened to this guy after 2000? He seems to have reinvented himself as, like, the best Papa Bear ever! The songs were fine, though - having heard them approximately ten billion times in the supermarket, gym, malls and autorickshaws - we were a little saturated. Special mention goes to the remix of the evergreen personal favorite Mera Mann Dole. I haven't seen this yet; I have to confess I'm pleasantly surprised to hear you refer to Deepika as "wonderful." Maybe I'll actually bother to bump it up my queue. You liked Rishi Kapoor post 2000? I loved him all along right from his debut Bobby. He might not have been given great characters but he always gave his 100% to every movie. More than that he always gives very fun interviews. I tend to disagree with your best papa bear award though. That would squarely belong to Prakash Raj. No contest. This is not as good as jab we met. But I think it's still good. Because I still enjoyed it a lot when I watched it w/out subtitles and basically didn't understand the dialogue. Deepika's acting is better in Love Aaj Kal but I still have some reservation about her acting. I did think Saif was kind of long in the tooth to be playing the clueless idiot for the umpteenth time (Ranbir has inherited that particular throne, methinks), but he is so good (especially in the Sardar avatar) that it really didnt matter, finally. I tolerated Deepika in this film but usually I think she is good for one thing, and that's being beautiful. The song "Aahun Aahun" at the end is my favourite. I honestly thought I would hate this movie, but though the plot is not "wow" I found the story well developed and enjoyable. Thanks for the post! Surprised to hear of your approval for Deepika. I loved the role, I haven't seen such a meaty one for a woman written in Bollywood perhaps all this year - but I thought someone with more talent could have really given it legs [not that hers aren't gorgeous]. Imagine this film being made with SRK and Kajol circa 1995! Alas. Alas. And Saif did not get any love from me in his yuppie avatar either. But it was a more thoughtful film than perhaps many of its critics credited it with. It might have been my favourite of the last six months, but for the existence of Vishal Bhardwaj. Totally agree with your review and your appreciation of Deepika. Was surprised with reviewers pointing her out as one of the weak links. She brought the required touch of poise and gravitas to her role. That smile and those long legs did help too. "Botox" Saif did very well too, though we have seen him do it before. And the Brazilian kudi was awesomely awkward in her song. A very good review of a truly good film. I enjoyed this movie for the very reasons you have listed in your review. What I can't understand is people expecting it to be another Jab We Met. KYA?!?! You liked Deepika in this? Oh noooo! I thought she was dreadfully dull and sort of spaced out, not very present. She was out-acted by the mute flashback girl! Though I am tooooootally with you on post-2000s Rishi. All aboard the Rishi train! "Saif Ali Khan is dependably charismatic", you say: well, that's news. Would you say he's evolving too towards a more mature stature? I too liked this film very much but no thanks to its two lead actors. Saif was too old for the part and Deepika doesn't have anything else going along with her good looks (but even those are somehow disturbing to me, there is something wrong with that one). And yes, she was out acted by the mute flashback girl, definitely. The film though was very good. It told its story beautifully and even made me cry at some point in the flashbacks. I loved the cameo too. Oh YES, PPCC, you are spot on with your review! I put off watching this film for ages because I was expecting it to be all mediocre and meh, but I really liked it, thought Deepika was wonderful, Saif was very convincing and likeable, and I even cried at the very first breakup scene because I was all like "BUT NO! You BELONG together!" And Rishi...oh he is glorious. PLUS RAHUL KHANNA! This movie has it all! That's what I like about Imtiaz's films. He's a great storyteller. His stories are simple, relatable and characters well written.